Lavinia and Henry arrive to take care of their nieces and nephew after their parents die. Henry has been given guardianship of the children. Lavinia has been brought up in privilege and believes that her father can give the children a better life. Even though her father has never acknowledged the children before, he is now interested in them. Lavinia sets out to win her case to take the children away from Henry. But the children are only interested in making a match between Lavinia and Henry! And even though Lavinia believes with all of her heart that she would be the better guardian, she cannot help but admire Henry and the way he is with the children. Oh Lavinia, Lavinia! I say that while shaking my head! At one point I had to message the author and tell her that Lavinia needed a "Come to Jesus" talk! My goodness that girl made me want to reach through the pages and shake her til her teeth rattled! Henry was much more understanding than I ever would be. He admired Lavinia for her stubbornness because he knew that she didn't have a leg to stand on to get the children. He was so patient in helping Lavinia understand that her grand schemes were just what her sister had escaped from and that the children would appreciate a more simpler way of life. I love when a book gets you so involved in the characters that you feel as if you are a part of the family. When I finished reading I truly missed Henry and Lavinia. Being thrown together to care for the children and with the help of the scheming trio, Henry and Lavinia's romance developed slowly and naturally. 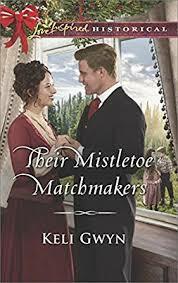 Their Mistletoe Matchmakers was a sweet Christmas read that will definitely help get you into the holiday spirit!